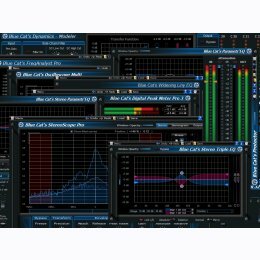 A complete professional digital audio processing environment in a single bundle: the Blue Cat's PatchWork standalone application and the complete collection of Blue Cat Audio's commercial audio plug-ins: a total of 20 products, including 6 award-winning unique audio analysis tools, 3 powerful dynamics processors, 4 premium equalizers, and a unique scripting plug-in to build your own effects or virtual instruments. You can download all the demo versions in a single package. It lets you try and buy all Blue Cat's commercial products at once. Microsoft Windows XP, Vista or Windows 7 and 8. Any DirectX / VST / RTAS compatible host software - 32 or 64 bit.